Let the awe-inspiring sights of the Red Centre take your breath away. From monolithic Uluru to the ethereal glow of the Field of Light. Gaze across the surreal glow of the Field of Light. Check off all the must-see Red Centre Highlights such Uluru, Kata-Tjuta and Kings Canyon. Remember to buy a slice of the amazing mango cheesecake at Wangi Falls during your Litchfield National Park tour. 1 night stay in Ayers Rock Resort at Sails in the Desert. Sunrise Field of Light tour. 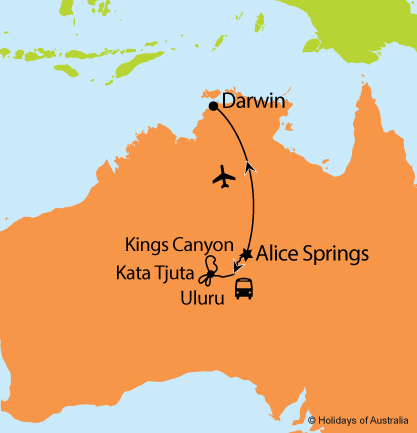 3 day Uluru & Kings Canyon Unearthed tour including Uluru, Kata-Tjuta and Kings Canyon. 3 night stay in Darwin at Doubletree by Hilton Esplanade including breakfast.